PARIS — Memphis Depay scored in the last minute of a frantic match to give Lyon a 3-2 win at third-placed Marseille that keeps alive its chances of Champions League soccer next season. In the fight for a Champions League playoff spot, fourth-placed Lyon closed the gap on Marseille to two points with eight games left. Monaco is seven points ahead of Marseille in second spot. The match at Stade Velodrome ended with players pushing and shoving after the final whistle. Lyon defender Marcelo then mockingly brandished a Lyon jersey in front of Marseille’s players as they were walking off. It sparked a further melee which took more than a minute before security officials brought it under control. Several players from both sides tried to get at each other, rather than walking away when they had the chance. It was the latest volatile incident in the French league. On Thursday, several police officers were injured after clashes with Lyon fans before a Europa League game against CSKA Moscow. This followed on from a mass pitch invasion by angry fans of struggling Lille on March 10, when about 200 fans charged onto the pitch to confront players after a home draw with Montpellier. As the players walked back through the tunnel to the dressing rooms, Marseille centre back Adil Rami had to be held back as he launched himself at Lyon goalkeeper Anthony Lopes. Marseille goalkeeper Steve Mandanda also had to be pushed away moments later as he sought to back Rami up. "When I see that it just makes me sad," said Lyon defender Jeremy Morel, who formerly played for Marseille. "This isn’t even about football. I think we’ve really had enough of this, we don’t need it." Marseille winger Florian Thauvin saw it differently. "Some Lyon players took the liberty of mocking us. It’s not professional on their part," Thauvin said. "They lacked respect. (Marcelo) is a professional player, he should be leading by example. They shouldn’t behave like that." Greece striker Kostas Mitroglou’s looping header in the 84th minute appeared to have earned Marseille a point, after Lyon midfielder Houssem Aouar put Lyon ahead 2-1 shortly after the break with a sweetly struck shot from winger Betrand Traore’s pass. Mitroglou then almost went clean through from the halfway line in the 89th, only to be incorrectly called back for offside. 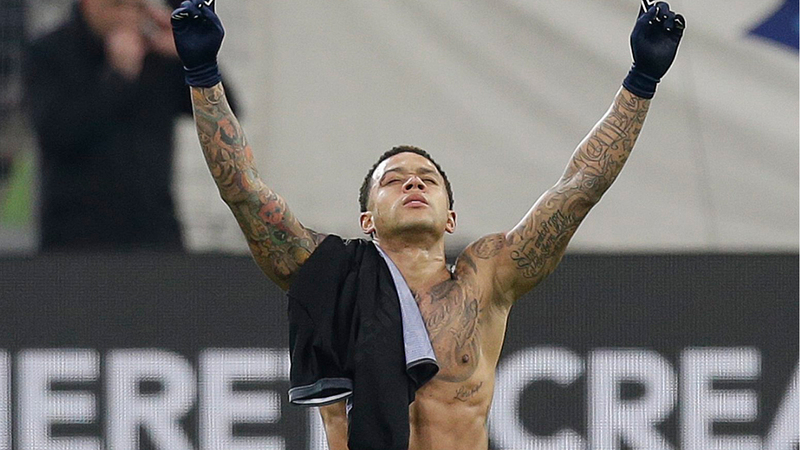 It proved a key moment as Depay scored the winner one minute later. Lopes took the free kick after the offside decision, striker Mariano Diaz headed the ball on just outside the edge of the penalty area and Depay read it well to nod it over the advancing Mandanda from just inside the area. Rami’s own-goal late in the first half cancelled out centre back partner Jorge Rolando’s opener in the 31st. "We defended really badly," Mandanda said. "We just didn’t match them in the challenges." Dani Alves took Paris Saint-Germain a step closer to the French title, scoring his first league goal of the season with a late header as PSG won 2-1 at Nice. The 34-year-old Brazil defender met midfielder Adrien Rabiot’s astute curling pass with a powerful header into the bottom right corner in the 82nd minute. PSG is 17 points clear of defending champion Monaco and almost certain to win its fifth title in six seasons. PSG has seven games left and Monaco has eight. Nice took the lead in the 17th minute. Mario Balotelli expertly chested down a high ball to the feet of strike partner Alassane Plea near the halfway line, and Plea’s pass sent Allan Saint-Maximin scampering though to finish coolly. Four minutes later, Angel Di Maria took advantage of slack defending to equalize. It was his ninth goal in 25 league games and he needs one more to match his career-best tally. The match started at 1 p.m. local time (1200 GMT) to capture a prime-time television audience in Asia. This follows on from the opening of a French league football office in Beijing last year. "The Spanish and the English did this before. We train in the mornings, so it shouldn’t be a problem," said Nice coach Lucien Favre, referring to the early kickoff. "I hope it was a good advert (for Ligue 1). It was a good game." Nice is in eighth place, three points above Saint-Etienne in ninth. Midtable Saint-Etienne beat Guingamp 2-0 at home to make it eight games unbeaten in the league. Serbia centre back Neven Subotic scored in the 29th minute from Slovenia striker Robert Beric’s cross. Winger Remy Cabella went past three players before scoring in the 79th. Nantes remained in sixth place after drawing 1-1 at last-place Metz. Nolan Roux’s right knee put Metz ahead in the 12th minute, as he slid in to meet a corner for his 12th league goal of the season. Midfielder Valentin Rongier equalized midway through the first half. Claudio Ranieri’s Nantes side is one point behind fifth-place Rennes, while Metz is nine points away from safety.